By the 1890s posters had taken centre stage in the visual culture of the French capital. 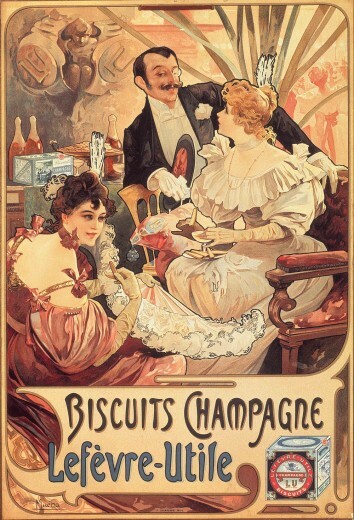 Thanks to the advancement of printing technology, the standard of colour lithography was improving and the material opulence of Belle Époque Paris provided talented artists with great opportunities to design advertising posters. The Paris hoardings had been the official posting places for advertising posters since the implementation of the Law on the Freedom of the Press in 1881; by then they had become ‘street galleries’, influencing the commercial success of both the advertisers and the artists designing the posters. In this competitive environment the artistic quality of the posters became increasingly important. With his innovative design for Gismonda Mucha arrived on Parisian street art scene at an opportune moment. As Mucha later wrote, his poster was ‘a breath of fresh air’ which the public had been looking for. In addition to the work for Sarah Bernhardt Mucha began to receive commissions for advertising designs from a variety of printers including Camis in Paris and Cassan Fils in Toulouse. It was, however, after 1896, when Mucha signed an exclusive contract with the Parisian company F. Champenois Imprimeur-Editeur, that his output in this field expanded dramatically. Champenois paid Mucha on a monthly basis; this provided him with financial security and that summer he was able to rent a large apartment and studio in the rue du Val de Grâce. The majority of Mucha’s Parisian posters were produced with Champenois and it is this body of work for which he is best known and internationally recognised. Mucha’s posters reflect the rich texture of modern life in fin-de-siècle Paris. The subjects range from cultural events and railway services to diverse consumer products such as perfume, cigarette paper, beer, champagne, chocolate and biscuits, as well as bicycles. For these posters Mucha developed a new style from the Gismonda prototype, featuring a single figure or the head of a seductive woman against a halo-like disk, which is arranged harmoniously with flowers and other decorative motifs. In his design the image of a woman was used strategically as a medium for communication, first to draw potential consumers’ attention with her feminine beauty and then to send an alluring message about the product she was representing.